DURHAM, N.C. — Duke University researchers have developed a handheld probe that can image individual photoreceptors in the eyes of infants. The technology, based on adaptive optics, will make it easier for physicians and scientists to observe these cells to diagnosis eye diseases and make early detection of brain-related diseases and trauma. Photoreceptors are specialized neurons that comprise the light-sensing cells of the retina, an extension of the central nervous system located at the back of the eye. The retina sends signals to the brain via the optic nerve, which then processes the visual information. Previous studies have shown that neurodegenerative diseases, including Alzheimer's and Parkinson's, as well as traumatic brain injuries, such as concussions, can alter the neuronal structures in the retina. To study these neuronal structures, researchers commonly use an adaptive optics scanning laser ophthalmoscope (AOSLO), a non-invasive tool that provides a significantly higher image resolution than an MRI. Although traditional AOSLO allows researchers to visualize individual photoreceptor cells, such systems are as large as a billiard table, costly and extremely complex. Its use has been limited to patients who are able to sit upright fix their gaze for several minutes, which means it is not as useful for young children or for adults with cognitive or mobility issues. The new system, called HAOSLO for handheld AOSLO, measures just 4 inches by 2 inches by 5.5 inches, and weighs less than half a pound. The Duke researchers transformed the AOSLO into a handheld probe by improving its optical, signal processing and mechanical designs. This included development of a new algorithm that replaces the traditional AOSLO's large wavefront sensing system, an optical component that can detect light distortion caused by the eye. The study appears August 23 in the journal Optica. "Other researchers have shown that the wavefront sensor can be replaced by an algorithm, but previous algorithms haven't been fast or robust enough to be used in a handheld device," said Theodore DuBose, a PhD student in the department of biomedical engineering at Duke and the first author of the paper. "The algorithm we developed is much faster than previous techniques and just as accurate." The tool was tested in a clinical trial with 12 adults and two children, where the team demonstrated its ability to capture detailed images of photoreceptors close to the fovea–the center of the retina where photoreceptors are smallest and vision is most acute. "Our new tool is fast and lightweight so physicians can take it directly to their patients, and the probe allows us to collect images quickly, even if there is movement," said Sina Farsiu, an associate professor in the departments of biomedical engineering and ophthalmology. "These capabilities allow us to open up the pool of patients who could benefit from this technology." The tool's new design makes it especially useful for imaging the eyes of young children. For example, premature newborns have a greater risk of developing eye diseases, like retinopathy, which can lead to blindness if not diagnosed quickly. Researchers can also use the tool to track early brain development in children by imaging their retina, which develops along with the central nervous system. The team is optimistic about the tool's use both inside and outside of the hospital. 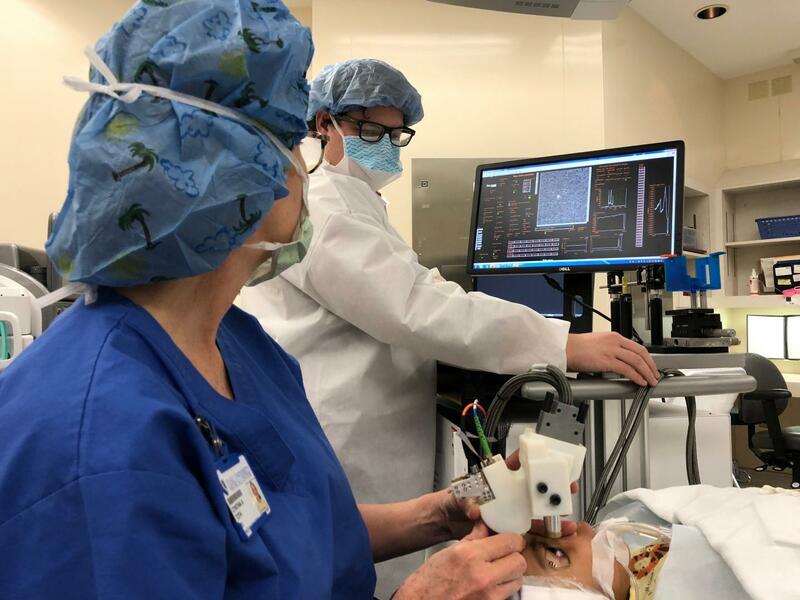 Because the HAOSLO can be taken into an operating room, physicians will be able to see the photoreceptors at the highest resolution possible during surgery, even when a patient is under anesthesia and in a reclined position. It could also help doctors rapidly assess possible brain trauma in athletes, such as football players coming off the field with head injuries. They also have made the mechanical designs, computational algorithms and control software freely available online so that other scientists can adapt the new system for their scientific applications. This study was supported by the National Institutes of Health (NIH R21EY02708 and NIH P30EY005722), and a 2018 Unrestricted Grant from Research to Prevent Blindness. In addition to Farsiu, Duke faculty on the team included Joseph Izatt, the Michael J. Fitzpatrick Professor of Engineering, and Cynthia Toth, the Joseph A.C. Wadsworth Professor of Ophthalmology at the Duke University School of Medicine.